Frank Lemond McVey was the President of the University of North Dakota from 1909-1917. Afterwards, while serving as President of the University of Kentucky, he became active as a painter. While no artworks have been found dating from his UND years, McVey’s artistic interests might have their origins in North Dakota. 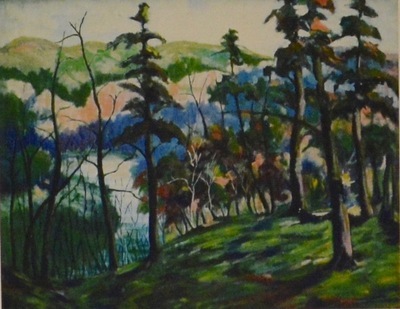 This image is a reproduction of a work by McVey from the permanent collection of The University of Kentucky Art Museum. McVey was not the only UND President who made art. Original works by former Presidents George A. Starcher and Charles A. Kupchella are displayed on the first floor of the Education Building. Current UND President, Robert O. Kelley, also has artistic talents, and a reproduction of a stained-glass panel by him is exhibited on the third floor of Twamley Hall (alongside reproductions of works by Presidents McVey, Starcher, and Kupchella).